We use fresh cheeses made by Cabot, Macadam & Yancy’s Fancy to make our grilled cheese melts. The taste of these cheeses, made by cheese makers in New York and Vermont, makes each of our melts unique and shows our commitment to local farmers throughout the region. From our signature cheese blend in the Say Cheese to the unique flavors in the Red Pepper Pesto & Spinach, each and every melt is made with the finest ingredients available. At Capitol Melts, we take the time to ensure that the quality of each of our melts meets the highest standards of flavor and freshness. 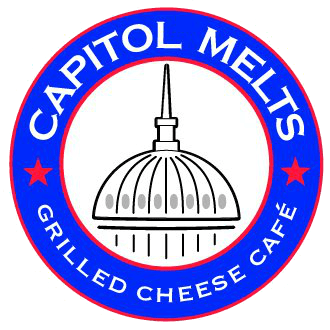 Capitol Melts has built a menu to appeal to all tastes. Our breakfast sandwiches are served on a Thomas’ Sandwich-Size English Muffin and include our Maple cheese-blend with Egg & Bacon. Our lunch menu includes customer favorites: Say Cheese-our unique cheese blend, Wingless Buffalo, Pulled Pork, Chipotle Habanero and many more. Check-out Menu for a full listing of our current grilled cheese selection.